Making progress along an individual hole calls for the golfer to master both the long and short aspects of the game. As the names suggest, we're talking yardage here. Hitting off the tee and using long irons or woods on the fairway fall into the former category where the object of the exercise is to achieve a position close to the green, in the optimum position possible to bring skills needed for the short game in to play. Or in golfing parlance, to attack the hole.Get both elements right and you'll be able to provide your putter with the right conditions to take all the glory by popping the ball into hole before proceeding on to the next hole. There are a number of skills of the short game that need to be mastered, each designed to handle the demands of the position the golfer finds him- or herself in and distance from the green involved. Let's start with that bane of everyone, the greenside bunker. Course designers love them because there is no greater feeling of satisfaction for them than lulling golfers in to a false sense of security with a fairly straight forward sequence down the fairway before ruining any hopes of a good score by drawing them in to the sand from where a hoped for birdie turns in to perhaps a par but all too often ends in a disappointing bogey. Situations in which a bunker is positioned in the line between the ball and green call for either the pitch shot or the flop shot, both of which are discussed elsewhere. 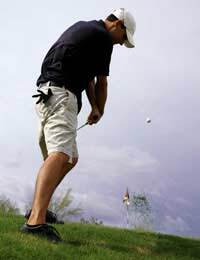 Both the pitch and flop involve achieving a measured amount of height so that the ball can leap over such a hazard or hazards and on to the green. In both cases, the club you are likely to choose is surprise, surprise, the pitching wedge because of the loft of the face. The more loft needed depends upon how close the bunker is; in the case of the flop shot we're talking an acute angle both into the air and down on to the green because of the minimum amount of space which the golfer has to play with in order to leave a reasonable putt on the green. In contrast, if the absence of bunkers leaves a clean run in to the green, then the situation calls for a chip shot. In contrast with the pitch or the flop, it is not height we're looking to achieve here but a low trajectory which culminates in the ball running on and as close to the pin as possible. Less loft, of course, means that rather than picking a pitching wedge, the six- or seven-iron is ideal although a chip over a greater distance may call for the services of a beefier iron such as a four. Whereas the long game is about controlled power, approach shots involve a subtle touch. The greater the subtlety, the more impressive and effective the shot, and the more disappointed the course designer will be in having failed to ensnare your ball.